WASHINGTON, DC, February 11, 2013 (ENS) – The marine mammal conservation group Sea Shepherd has asked the U.S. Supreme Court to lift a lower court order forbidding its ships from approaching the Japanese whaling fleet now trying to catch whales in the Southern Ocean south of Australia. In an application to the Supreme Court filed on Friday, Sea Shepherd and its founder Paul Watson said the lower court “acted rashly” and expressed concern over the order’s “extraordinarily long reach” to areas outside U.S. jurisdiction. Sea Shepherd is subject to a restraining order issued December 17, 2012 by the U.S. Ninth Circuit Court of Appeals in a case brought by Japan’s government-supported Institute for Cetacean Research, which runs the country’s “research” whaling. 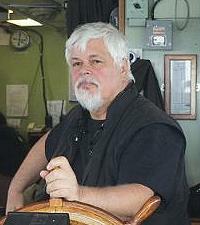 The court order enjoins Sea Shepherd, Watson and anyone “acting in concert with them” from coming closer than 500 yards to a Japanese whaling vessel, from physically attacking the Japanese ships or any person on them and from navigating in a manner that is likely to endanger safe navigation at sea. For the past eight years, Sea Shepherd ships have interfered with the Japanese whaling fleet, taking actions such as throwing bottles of rotten butter onto them, to which the Japanese replied with water cannon. In a news conference at the National Press Club in Washington, DC on Monday, environmental lawyer Robert F. Kennedy Jr., urged the United States to show support for the Sea Shepherd Conservation Society and Watson. “It’s a mission that only they are capable of accomplishing and that is absolutely vital to the enforcement of international agreements on the high seas which otherwise go unenforced,” Kennedy told reporters. In 1986, the International Whaling Commission enacted a moratorium on all commercial whaling. Since then, three nations – Iceland, Norway, and Japan – have killed over 25,000 whales. The IWC does not have the capacity to enforce the moratorium. Sea Shepherd, guided by the United Nations World Charter for Nature, is the only organization whose mission is to enforce these international conservation regulations on the high seas. The IWC has declared a whale sanctuary in the Southern Ocean, but Japan has set its own annual quota of 950 minke whales and 50 endangered fin whales and 50 humpback whales. Japan justifies its whaling with a loophole in the moratorium that allows lethal research whaling. The meat from whales killed for “research” is marketed in Japan. Last year, Sea Shepherd interference kept the Japanese from taking 768 whales of their quota. No Japanese crew members have ever been injured in any Sea Shepherd campaign, but in 2008 Watson survived a shooting when his kevlar vest stopped a bullet fired from a Japanese whaler. Sea Shepherd released a letter from a lawyer representing the ICR, which complained that the Sea Shepherd ship Brigitte Bardot, a former racing vessel named after the French actress and animal rights activist, violated the 500-yard injunction on January 29. The letter warned that the institute could ask that Sea Shepherd be found in contempt of court unless the group orders the Brigitte Bardot to comply with the injunction or returns it to port. The Sea Shepherd maintains it is observing the injunction, saying the Brigitte Bardot sails under an Australian flag and is operated by Sea Shepherd Australia, a separate organization. This season’s whale defense campaign is under the direction of Sea Shepherd Australia, now that Watson has handed authority to former Australian Greens leader and senator Bob Brown and Sea Shepherd Australia Director Jeff Hansen. Authority was transferred in compliance with the restraining order and in light of Watson’s escape last summer from Germany, where he was detained on bail for possible extradition to Costa Rica. The Sea Shepherd fleet of four ships, one helicopter, drones, and more than 120 volunteer crew members from around the world has to date succeeded in keeping the four-vessel Japanese fleet of “research” whalers separated and on the run, making it impossible for them to catch whales, Hansen says. 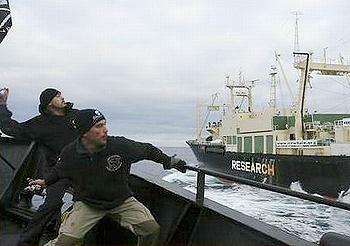 Watson says he will “document the campaign” against Japanese whaling in Antarctic waters. The Steve Irwin is captained this season by former first officer Siddharth Chakravarty of India.